SAFETY: During Charlie’s first term as Commissioner, the Pct 2 office installed many preventive measures that decreased road flooding, and prevented accidents, during major rains. These included road arm barricades (which close off flooded roads), drainage improvements throughout Pct 2, and raising the elevation of roads known for flooding. Riley also approved the addition of over 64 law enforcement positions throughout Montgomery County. MOBILITY: As your Commissioner, Charlie led a mobility plan which will transform Precinct 2. It includes 13 road bond projects that will be near completion by the end of his first term, in 2018. Charlie also worked with Iron Man to reroute their path off of FM 1488. This alleviated congestion and disruption, for both residents and businesses, in our Precinct. Additionally, Commissioner Riley shaved years off of construction time by working closely with TXDOT to move major state road projects forward, such as the 1488 and 1774 overpasses. FINANCIAL: At Commissioners Court, Riley supported, and passed, the 20% homestead exemption on the county Property Tax and lowered the tax rate. Under Commissioner Riley’s leadership, Montgomery County has cut its 2018 budget by nearly $20 million. Charlie has also managed a fiscally conservative office staff budget, saving countless dollars which were used toward roads and bridges. SERVICE: Serving the community has been a calling for Charlie’s family, starting with his parents Buddy & Alice Riley. During Commissioner Riley’s first three years in office, his campaign has donated over $85,000 to local charities, with an emphasis on schools and senior citizens. A couple of Charlie’s God-given talents are singing and cooking for people. He has cooked and sang all over Montgomery County to help raise money for benefits and to entertain school children and senior citizens. In addition to working hard for the taxpayer, this is how Commissioner Riley knows to help our community and he’ll continue doing it as long as he am able. 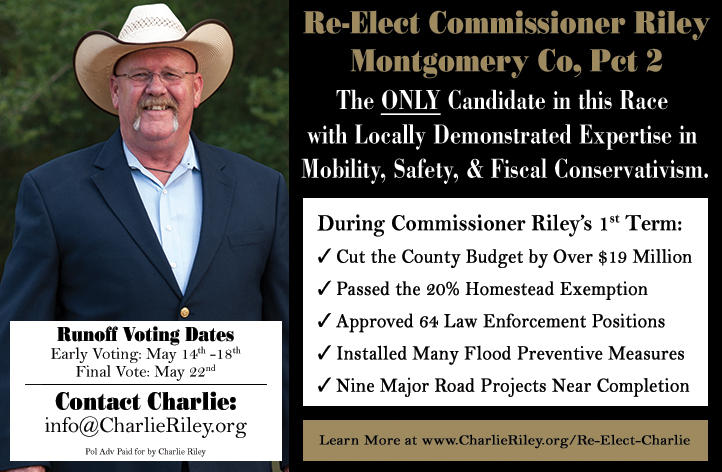 Re-Elect Commissioner Riley…. The ONLY Proven Candidate in this Race with Locally Demonstrated Expertise in Mobility, Safety, & Fiscal Conservativism.